Charles C. Kingston, 85, of Arendtsville, died Sunday morning, June 19, 2016 at the Gettysburg Hospital. Born Aug. 27, 1930 in York, he was the son of the late Vincent F. and Louise A. (Helfrich) Kingston. He was the husband of the late Ann E. (Cox) Kingston who died March 28, 1991. Mr. Kingston was a member of St. Francis Xavier Catholic Church, Gettysburg. He was a 1948 graduate of York Catholic High School, 1958 graduate of Mt. St. Mary’s College and received a distinguished alumni award from there in 1980. Charlie was a veteran of the United States Air Force, serving during the Korean War from 1948-52 where he flew weather missions in the western Pacific, and the Korean War zone, based at Anderson AFB, Guam. . He held various jobs including 25 years at C.H. Mussleman Company Division of Pet Inc. as supervisor, director of personnel, and director of fruit procurement; the Commonwealth of Pennsylvania at the Department of Agriculture, promotion of fruit products; as director of Bureau of Labor Standards, Department of Labor & Industry; Prudential Insurance Company salesman; and a Licensed Battlefield Guide from 1987 to the present. He earned his guide badge in June of 1989 and eventually earned status as Guide Emeritus for his many years of service. His Badge Number was 70. He was involved in a number of community activities including, member of the Upper Adams Lions Club and charter member of the Upper Adams Jaycees. He served as chairman of the Jaycees from 1963-65 and was instrumental in the founding of the National Apple Harvest Festival. 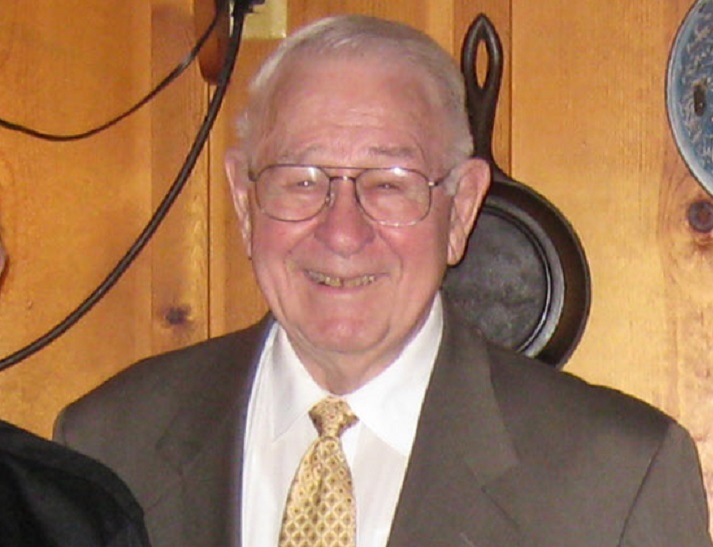 He served as board member and chairman of the board of Oakside Park from 1967-72. He was member and president of the board of directors of the Black Walnut District, York-Adams Area Council, Boy Scouts of America 1960-80 where he received the District Service Award in 1968 and the Silver Beaver Award in 1974. He was member of the Gettysburg Rotary Club and the Licensed Battlefield Guide Association. He was also an elected member of the Biglerville Borough Council until resigning when he moved to Arendtsville then held a position of that council as president. Charles is survived by his two children, Gregory C. Kingston and his wife Deborah A. (Witherow) Kingston of Biglerville, and Jeanne L. (Kingston) Bell and her husband George H Bell III of Snowshoe, W.V. ; six grandchildren, Timothy C. Kingston, Aaron G. Kingston, Hannah E. Kingston, Graham E. Bell, Clay S. Bell, and Eleanor L. Bell; four great-grandchildren; and his twin brother Vincent F. Kingston Jr., of York. He was preceded in death by his son John A. Kingston, and his brother Michael J Kingston. A Mass of Christian Burial was held at 11 a.m. Friday, June 24, 2016 at St. Francis Xavier Catholic Church, 25 W. High St., Gettysburg. Burial with full military honors presented by the Adams County Allied Veterans was in the St. Francis Cemetery. Online condolences may be made at monahanfuneralhome.com. In lieu of flowers, memorial gifts can be made to the Gettysburg Hospital Foundation’s Adams Cancer Patient Help Fund, 455 S. Washington Street, Suite 11, Gettysburg, PA 17325 or online at www.wellspan.org/ghf.